Those of you who have the misfortune to NOT live in this part of the planet probably won't be at the Aussie itSMF conference to meet me, so how about coming to debate service catalogues with me on next week's webinar where I'll be giving my own unconventional views on the topic. We'll be taking live questions! Next story: What does it mean when there is a Second Edition of a core ITIL V3 book? Submitted by Ricardo Clemente (not verified) on Mon, 2010-07-05 20:47. Do you have a podcast or video from this presentation? Submitted by skeptic on Wed, 2010-07-14 10:25. 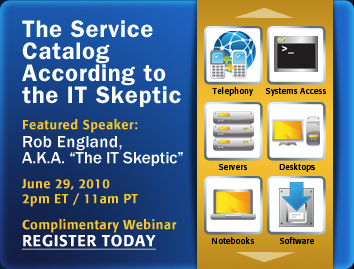 A recorded version of my Service Catalogue webinar is available. You have to sign up for it. That's show biz. Submitted by SP Laurent (not verified) on Thu, 2012-05-24 11:25. Is the video still available ? The link is dead, is there any way to have access to your presentation ?